According to the official website, episode 1 of "Suzumiya Haruhi-chan no Yuuutsu" and "Nyoro-n Churuya-san" will be aired on Youtube Kadokawa Channel on Feb 13th at 10pm JST (5am PST). They will upload a new episode once a week, but the dates and time of the updates may be irregular due to the fancy of Danchou Suzumiya Haruhi. New information of "The Melancholy of Haruhi Suzumiya 2" will be announced in the March issue of Newtype magazine to be released in February (probably 9th or 10th). 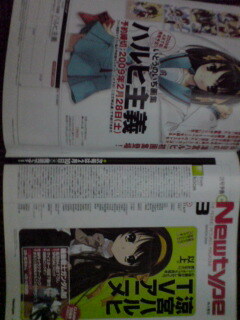 The preview of the next issue says "If you want the info of the new Haruhi anime, read the March issue of NewType. That's all. (This time, we mean the bigger Haruhi.)" im still waiting for that 'announcement of an announcement' thing for haruhi. better be something interesting, lol. So, is Hirano Aya voicing Haruhi-chan or not? The VA cast is the same as that of the original Haruhi. Why there isn't a new season of Haruhi yet? FMP fans have been demanding for a new season, for longer. Let's suppose that KyoAni decides to stick with Haruhi. This time, the complainers would be the fans of Key! xD Or maybe the fans of KyoAni as a whole, because we can't deny them the possibility of making an anime of their own creation, like Munto. I really don't care when we will have Haruhi Season 2, because it's obvious that we'll have it, sooner or later. I do find really amazing the releasing of these miniseries; it's far better than nothing. Oooooh. :D I'm looking forward to this, and hoping that somehow, it will be subbed. Is the 10th (the unpublished one) light novel the last one (like a grand finale) ? It'd better be extra long. So an parody instead? First Shana, followed by Toaru and now Haruhi gets her own chibi-parody as well. Didn't expect that from KyoAni, only from JC Staff... Oh well, as long as it has some things in it that makes every otaku want to watch it. Wait, there is. Haruhi. I think Kyoto has been afraid of making a 2nd season because fans have too much expectations from it. My personal explanation for the delays of the second season is that the original author hasn't released the last novel. KyoAni probably wants to know the whole story before they animate so they can plan out season 3, 4 and 5 or whatever with decent sprinklings of future seasons for multiple viewing purposes. Then again, they just might be the biggest trolls in the universe or terrified of failing. I'm just worried that Haruhi-chan is gonna turn out the same as Petit Eva, and how do you make an anime from the Churuya 4koma? They're all the same joke! Ah, should be refreshingly naff.